These look good, don't they? Unfortunately, these baked sweet potato wedges didn't quite turn out the way I had envisioned. I tossed the wedges in canola oil, salt, pepper, and cumin and baked them in a 400-degree oven for about 30 minutes. They tasted alright. I had hoped for a crispier outer coating, however, that really didn't happen. I'll make these again. 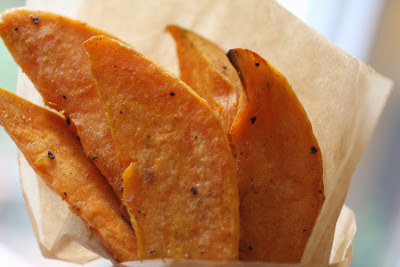 The next time, though, I'll cut the sweet potatoes into thin matchsticks and then bake them. Hopefully, I'll get the crispy outer coating I'm looking for without having to resort to deep frying.